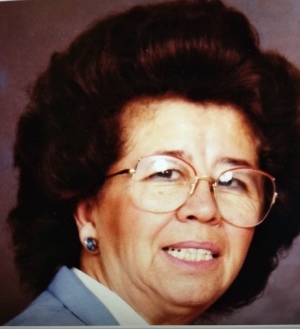 Sofia V. Tafoya, 84, of Boulder, Colorado, passed away on February 3.2019. She was born in El Paso, Texas on March 10.1034, to Luis and Carmen Valles. She was married to William Flores Tafoya on December 27,1968. Sofia was a dedicated wife, mother, and grandmother. She worked in the heathcare provider industry as a care giver for many years, where she received recognitions for for her outstanding performance. She was an active member of her community, volunteering her time and talent to various causes. She was a member of Immaculate Conception Church in Lafayette, Colorado. Sofia enjoyed traveling and spending time with her family. she id preceded in death by her mother and father, and her son Charles Anthony Bowyer. Surviving family members include her husband, William; her son Toby R Bowyer, her daughter Jo Ann Wiser and her husband James Clay Wiser; her son Micheal Lawrence Tafoya and his wife Sue Tafoya. Grandchildren include; Jessica Carvazos and her wife Lisa; Toby Bowyer, Christine Bowyer, Charles Hugh Bowyer, Shaun Ignacio Bowyer, Javier Delao Jr., Rick Daniel Delao, Jazzmin Dominique Tafoya, Madison Margaret Wiser, Sydney Curbow, Steven Curbow, Rebecca Lynn Curbow, and Rikki Louis Curbow. She is also survived by 7 great grandchildren: Darian Cavazos, Alexandra Cavazos, Adrian Cavazos, Cadence Sofia Delao, Liam Nathaniel Delao, Ryu Dorian Torrez, Ryan Dominik Torrez; and two great-great grandchildren: Athena Cavazos and Josiah Cavazos. Sofia was a compassionate and caring wife, mother, and grandmother, and friends to many. She had a good sense of humor, a fiery spirit and a strong will. She was dearly loved by all who crossed paths with her. We will all miss her dearly. Sofia, rest in peace, and know that your family garden will continue to grow strong, thanks to all the love and care you so tenderly gave. Funeral Services will be Monday February 11, 2019. Rosary 9:30AM to 10:00AM Mass of Christian Burial 10:00AM to 11:00AM Immaculate Conception Catholic Church. Address: 715 Cabrini Dr, Lafayette,Colorado. Burial will be at Fort Logan National Cemetery Stage Area "C" 2:15PM. Address: 4400 W Kenyon Ave, Denver, Colorado 80236. Arrangements by Erlinger Funeral Home and cremation Service, Lafayette, Colorado.